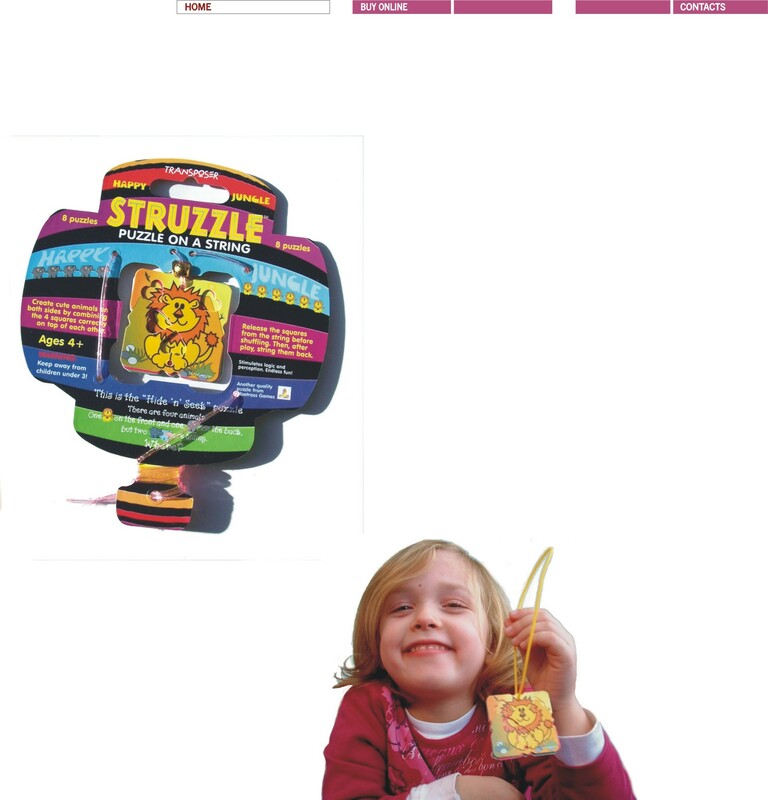 A PRE-SCHOOL PUZZLE FOR CHILDREN AGED 4 AND UP, THE STRUZZLE IS THE FIRST EVER PUZZLE ON A STRING. A TRANSPOSER-STYLE PUZZLE, IT CONSISTS OF FOUR PLASTIC SQUARES WITH HEART-SHAPED WINDOWS. THE AIM IS TO CREATE PICTURES OF FOUR CUTE ANIMALS BY COMBINING THE SQUARES CORRECTLY ON TOP OF ONE ANOTHER. THE FOUR PIECES SHOULD BE RELEASED FROM THE STRING BEFORE PLAY AND THEN STRINGED BACK AFTER PLAY.THAT PRIMARILY PREVENTS LOSS OF PIECES BUT ALSO MAKES THE PUZZLE HIGHLY PORTABLE AND ALLOWS THE CHILD TO INTERACT WITH THE PUZZLE IN DIFFERENT WAYS. THE STRUZZLE HAS EIGHT DIFFERENT SOLUTIONS, FOUR FOR ONE SIDE ONLY, WHICH THE CHILD IS EXPECTED TO TACKLE FIRST, AND FOUR, MORE ADVANCED, FOR BOTH SIDES OF THE PUZZLE. THE PACKAGING IS EXTREMELY UNUSUAL AND COLOURFUL, AS CAN BE SEEN ON THE LEFT. THE PUZZLE SECURELY HANGS BY ITS STRING ON A VERY STURDY LAMINATED CARD. THE STRING IS THEN GUIDED THROUGH A SERIES OF HOLES AND WOUND AROUND A “TAIL”.